The babies all spend the longest time looking at the face on the left. Thus demonstrating an innate human preference for looking at faces. Goldstein and Spencer showed participants unique images such as snowflakes, ink blots and faces. They found statistically significantly more faces were recalled than any of the other images. 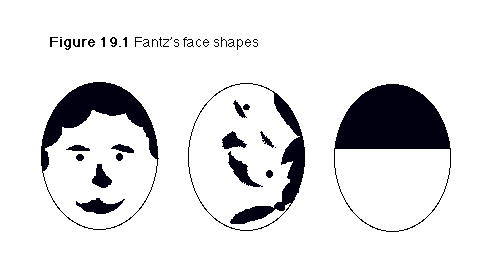 Sinha’s Meta analyisis of stranger face reconstruction (2006) concluded with eight key points. Can you see who it is? 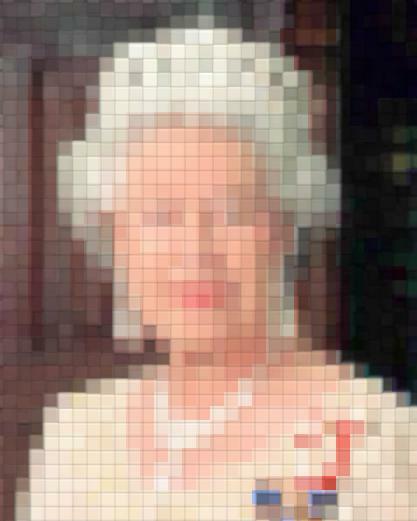 The chances are, you recognised Queen Elizabeth II of England. Despite the crude pixelation of the image. Humans can recognise faces even if the mode of communication is poor, for example low resolution images – the more familiar the person is, the more likely it is that they will be recognised in low resolution images. Therefore, facial features of familiar people are processed as a whole rather than component parts. Sinha found that identifying person is heavily reliant upon the eyebrows and the hairline and both lighting and motion can both influence recognition. There are specialised neurones for facial recognition and identity and expression and processed by different cognitive systems. To study and understand the relative recognisability of internal and external features of facial composites. The participants were shown 10 target photographs of famous people and 40 composite images produced by various computer programs. The participants were random assigned to one of the three composite sets and tested individually. All the faces were clean shaven and faces were glasses were avoided. The results of both experiment one and two suggest that recall of faces focuses mainly on the external features. The problem with both sets of results was that causation cannot be inferred. Both the complete composites and external composites were sorted with similar results with around 35% correct. Whereas the internal composites were around 19.5% correct. Both complete faces and external faces were matched with the same level of accuracy, which was significantly greater than the internal faces. The results of this study suggest that there is something about the internal features of a face which impair cognitive reconstruction of the face, even when a face is familiar. + Laboratory experiments are high in controls and therefore highly valid. – Ecological validity – the study is not ecologically valid in terms of witnesses identifying criminals, when a person has to identify a criminal they have only seen them once, this was not accounted for in the study. – Ethnocentrism, the study was only focused on volunteers from Stirling University.